Our all new Cero AR30 Evo is here, the culmination of months development to improve on our multiple award winning and bestselling AR30. We have meticulously looked at every aspect of the wheel to improve and enhance your ride where possible whilst still maintaining incredibly competitive pricing. The AR30 Evo features a tubeless ready rim profile with an outer measurement of 22mm and inner of 17.4, this allows better fitment of a wider tyre improving the aerodynamics, comfort and rolling resistance. The new lightweight Cero hub set laces Sapims range topping and renowned CX ray spoke to our rim via the J bend fitment – increasing stiffness, strength whilst reducing weight. The freehub body fitted now includes extra sealed bearings to help keep the worst of the weather out. 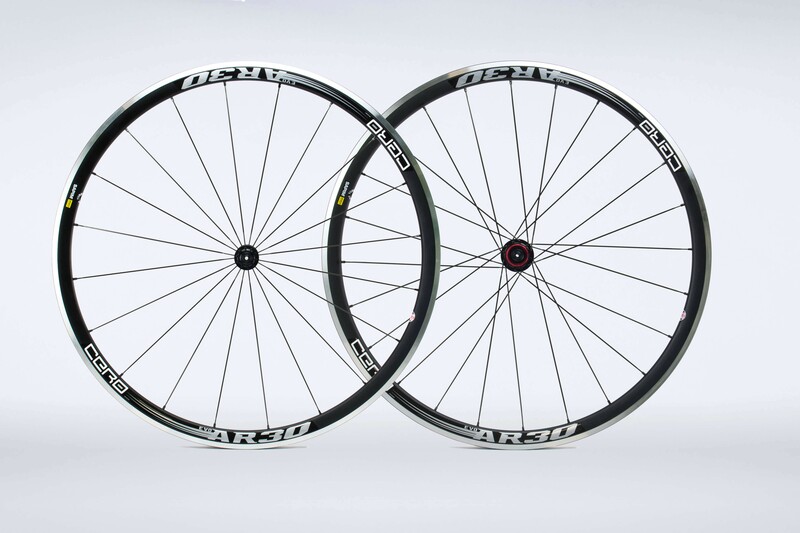 Rim: The new AR30 rim has been selected for its performance benefits, the tubeless compatibility gives you the option of running tubeless or standard clincher tyres and innertubes. Going tubeless allows you to run at a lower pressure without fear of pinch flats, once the wheels are filled with sealant puncture protection is vastly enhanced with holes up to 3mm being sealed allowing you to continue your ride. The wider rim better accommodates the use of larger tyres, creating a more aero profile and giving a more comfortable and complete ride. Spokes: The often-overlooked component in a wheelset, they bear the load, transfer power, absorb the rigors of the road and ensure a smooth ride. Spokes must be strong enough to take the incredible and varied braking and accelerating forces you subject your bike to on any terrain. We don’t compromise on quality to hit price points, we offer the best spoke available today, the Sapim CX-Ray. The CX-Ray still receives the best results in fatigue testing of any spoke available, its unrivalled strength, light weight, aerodynamics and flexibility make the CX-Ray the perfect choice for a high end racing wheel. -Longer lasting than any other spoke on the market. -Produced from high-tensile fatigue resistant 18/8 stainless steel. -Rear hub: Compatible with SRAM/Shimano and Campagnolo 9/10/11 speed. -Provided with our Cero 92g Quick Release set featuring alloy lever with Ni-Cromo Hollow Axle.